Ladies, hold onto your hats, and lads, plug your ears against the screams - former teen hearthrobs The Osmonds are coming to town! Danielle Cumber caught up with the youngest member of the group 'Little' Jimmy Osmond to find out what the mature three-piece have got in store for their final UK tour, Up Close And Personal. "This is the longest back-to-back tour in the UK. 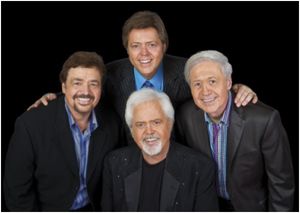 It's the most dates but not the biggest venues," explained charming Jimmy, who along with brothers Merrill and Jay, makes up the current Osmonds line-up, after brother Wayne suffered a stroke just prior to the tour. "The hard part is not the shows as we enjoy them, the hard part is all the travelling. We try to make it so we can drive a couple of hours between venues and see some of the countryside. I enjoy it. It's very tough on families and it's hard on my brothers as we're not spring chickens! We're road warriors, all we've known is touring. Jimmy promised die-hard fans - many of whom have been following the group since the 60s - that they'd be treated to all the hits, including One Bad Apple, Love Me For A Reason, Crazy Horses and Long Haired Lover From Liverpool. "We have a set list that lasts five hours so we have to cut it down!" he added. "It depends on the audience but there will be all the older songs. It's nice to be with my brothers. It's nice as the youngest to see the musical history being remembered." And what's next for the brothers? "Jay and I will probably still tour," Jimmy assured me. "But Merrill was the heart. Donny and I took a lot of the credit but Merrill was the main voice of the Osmonds brothers. He was the original. He has lots of personal things which he should do. We said 'this is your time, you should go and do what you want'. "We're really grateful we're going to be able to come to the UK and share this last tour with all our friends," he added. "We have been very lucky to stay in this business and secure dates for these shows especially in this economic climate. Our fans have been so loyal it blows my mind." The Hexagon show is sold out. Visit www.osmond.com.